Nash County | Scuffalong: Genealogy. Nash County – Scuffalong: Genealogy. Both of my grandfathers died long before I was born. In 1958, however, my paternal grandmother married Jonah Catellus Ricks and moved to Philadelphia with him. He died just before I turned three, but I am told I was fiercely attached to him. Hattie Henderson Ricks and Jonah C. Ricks, Philadelphia, circa 1957. Among the cache of funeral programs my grandmother left is a trove memorializing services for Granddaddy Ricks’ people, many of whom migrated to Philadelphia with him. His father, Jonah Lewis Ricks, lived in Philly for a time, but returned to North Carolina in late adulthood and died in Wilson in 1960. Jonah L. Ricks was born near Bailey, Nash County, in 1885. His mother, Nancy Jones Ricks, was born about 1865 in western Wilson County to Jacob and Milly Powell Jones, both born into free families of color. (Jacob was a grandson of Bethana Jones.) Jonah’s father was Joseph Ricks. Jonah L. Ricks, Wilson, 1953. Joseph’s death certificate, filed in Nash County in 1949, asserts that he was born about 1876 in Nash County to Square [sic] and Nicey Ricks. However, the censuses of 1900, 1910, 1920 and 1930 consistently list 1860 as his birth year. What follows is a summary of research I conducted to pierce the veil of slavery and shed light on Joseph Ricks’ family just before and after Emancipation. Initially, I was unable to find either Joseph Ricks or his parents in the 1870 and 1880 censuses. However, I had found a Kinchen R. Ricks (1858-1915) whose Nash County death certificate listed his parents as Squire Ricks and Nicie Braswell, so I looked for him instead. In the 1880 census of Jackson township, Nash County, 22 year-old Kenchin Ricks appears as a servant in the household of Marmaduke Ricks. Next door is this household: Sqare Perry, wife Nicy, and their children, including 18 year-old Joseph. I went back ten years to 1870 to find, in Chesterfield township, Nash County: Esqire Perry, 52, wife Nicey, 47, and children Primus, 22, Willie, 18, Mary J., 16, Rebecca, 13, Kinchen, 11, Joseph, 9, Robert, 8, and Matilda, 6. Also sharing the household were Judy Finch, 19, and her 7 month-old Nancy, and Sham Freeman, 63, Silva, 58, Mary, 25, and Rosa Freeman, 18. Thus I determined that Joseph Ricks was known as Joseph Perry as a child. His parents were known as Squire and Nicey Perry and, I later determined, all of his siblings except brother Kinchen retained the surname Perry. Squire Perry was born circa 1815, according to census records. His wife Nicey was born circa 1824. As neither appears in censuses earlier than 1870, I assumed that both were born slaves. 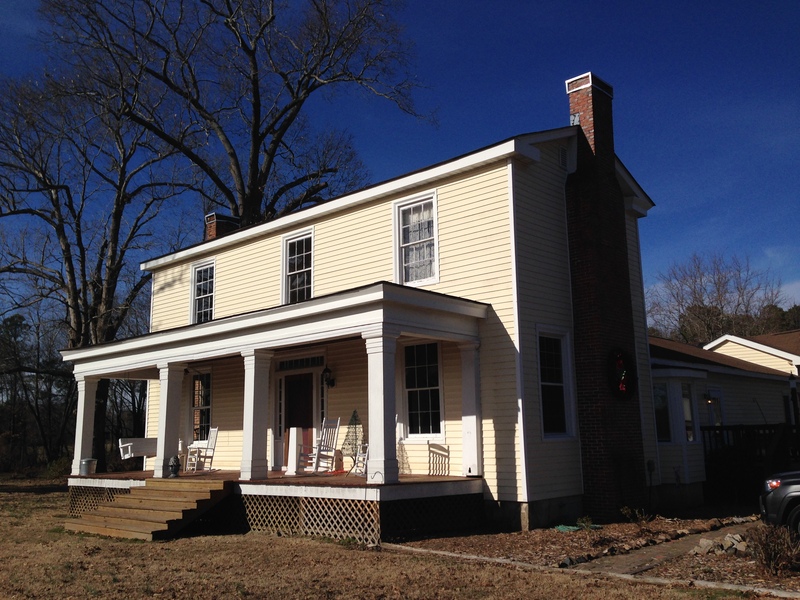 I consulted Timothy Rackley’s volumes on Nash County estate divisions and slave cohabitations and discovered records of the division of the estate of Clabourn Finch, which was conducted 18 December 1849. Finch’s property, which included slaves Jacob, Benjamin, Squire, Sam, Henry, Gilbert, Adam, Primus, and Nicy and her child, was divided among his heirs. Squire, valued at $550, went to Finch’s daughter Betsy and her husband Jacob Strickland. Nicy and child, valued at $700, went to Finch’s daughter Nicy and her husband Marmaduke Ricks. Thus, the family was divided during the last decade and a half of slavery. Page from the estate of Clabourn Finch, Nash County, 1849. The enslaved people distributed to his heirs at November Term of court differ slightly from those listed in this inventory. The 1850 slave census of Nash County shows Jacob Strickland as the owner of four slaves and Marmaduke Ricks as the owner of ten. The 1860 slave census of Sullivants township, Nash County, lists him as the owner of 18 slaves. Among post-Emancipation Nash County cohabitation records, I discovered that, on 19 August 1866, Esquire Strickland and Nicey Ricks registered their 22-year marriage with a Nash County Justice of the Peace. At the time they reunited, each was using the surname of his or her most recent former owner. By the 1870 census, however, as noted above, Squire had settled upon Perry. It is probably not coincidence that another of Clabourn Finch’s daughters, Ann C., was married to a Perry. Clabourn Finch’s slaves were divided among his children at his death and may have been further sold or traded within the family. At present, Squire’s reason for choosing Perry rather than Ricks or Strickland is not clear, nor is the basis for Joseph Ricks’ report on his brother Kinchen’s death certificate that their mother’s maiden was Braswell. Similarly, the reason that two of their sons, Kinchen and Joseph, reverted to Ricks is unclear. Original photographs and funeral program in my possession. Federal population schedules; North Carolina Certificates of Death filed in Nash and Wilson Counties; Timothy W. Rackley, Nash County North Carolina Division of Estate Slaves & Cohabitation Record 1862-1866; Rackley, Nash County North Carolina Division of Estate Slaves 1829-1861; North Carolina Wills and Estates, 1665-1998 [database on-line], http://www.ancestry.com. Kinchen’s Kinchen’s Kinchen’s Kinchen …. It took a little while, but we finally caught up as I sat waiting for a flight to Philadelphia. I’ll call him “Cal.” He goes by a different nickname, but he bears — with pride, but some chagrin — the same name as his forebear. It’s been passed down generation after generation after generation and, in spite of himself, he passed it on, too. 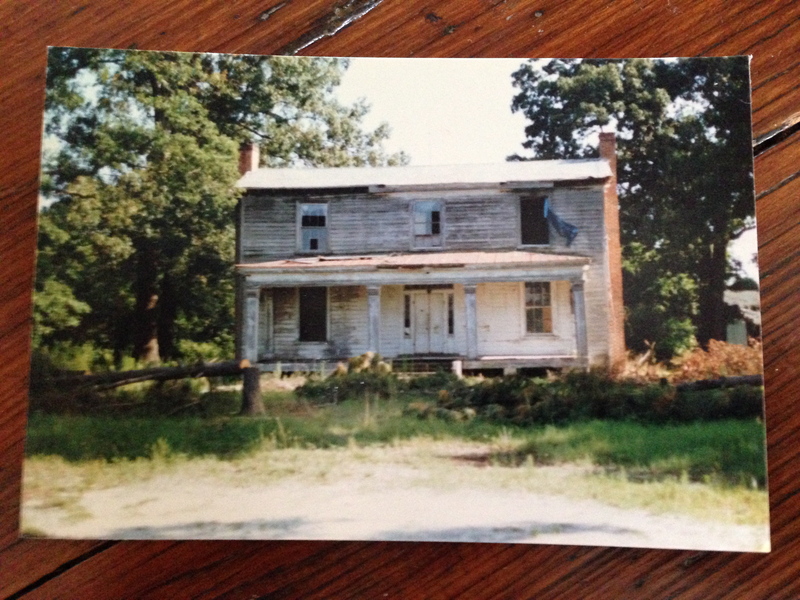 Cal grew up within shouting distance of the Kinchen C. Taylor house that I wrote about, and his father and uncle are among the last of Kinchen Taylor’s descendants holding property passed down from him. He’s a few years younger than I am, and he thinks Kinchen Senior’s house was already in shambles during his childhood. He was aware that Kinchen had accumulated vast tracts of farm and woodland in northern Nash County, but dismayed that he had owned so many slaves. That he had owned any at all, really. Without them, of course, his great-great-great-grandfather’s thousands of acres would have been a wilderness of swamp and impenetrable forest. Cal also wondered if we were perhaps related, but I have no reason to believe that we are. Many thanks to “Cal” for reaching out and for sharing his connection to Taylor Crossroads. Tarboro’ Press, 1 March 1845. He would be murdered if he did not cease. 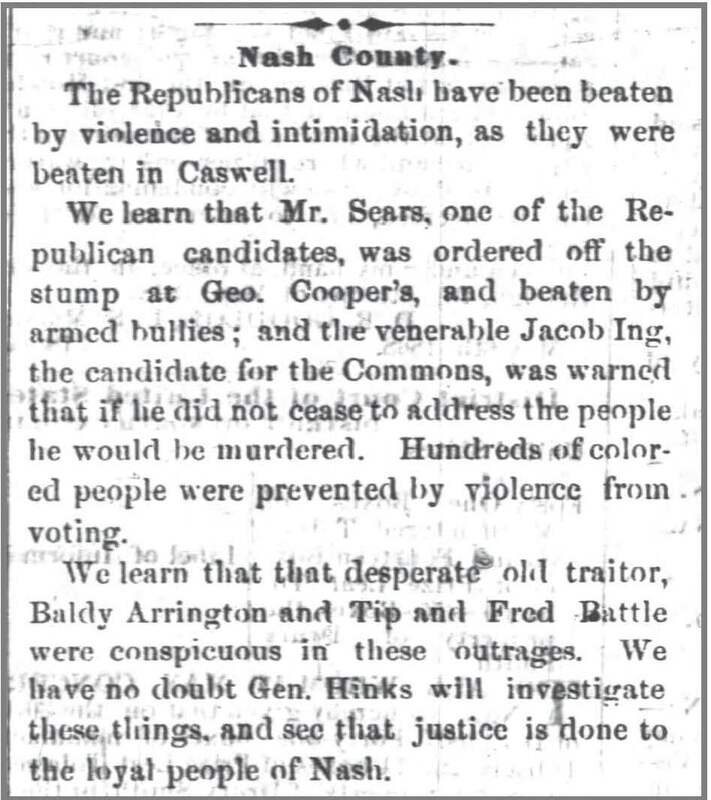 Raleigh Weekly Standard, 6 May 1868. Jacob Ing’s radical ideas surfaced well before Reconstruction. As made clear in his last will and testament, he had a long relationship with a free woman of color named Chaney Jones (also known as Hester or Easter Jones) and fathered several children for whom he provided. 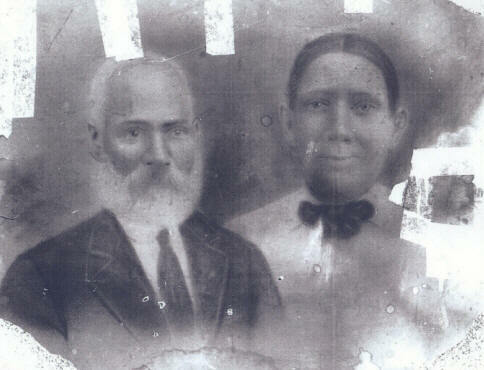 One, daughter Lucinda, was the first legal wife of my great-great-great-grandfather Adam T. Artis. Where did they go?, no. 4: Taylor. Kinchen Taylor’s death in 1853 sent shockwaves through the community of enslaved men and women who labored on his plantation. In addition to more than 100 slaves, Taylor owned more several thousand acres of land in northern Nash County. Half of Taylor’s children were minors, and his slaves had to have known that the division and distribution of his property would wrench apart their community. Taylor’s executors filed at least two inventories of his property, listing his slaves in no apparent order, but grouping mothers with their youngest children. My great-great-grandfather Green, about 38 years old in the 1856 inventory and valued at $750, is #30, while his wife Fereby and their oldest children Dallas, Peter and Henrietta are #88-91. Though some of Kinchen Taylor’s slaves were apportioned to Taylor’s adult children, most, including Green and his family, were placed in a pool to be later divided among the minors. Or sold for their benefit. (In the meantime, adults and older children were likely leased to nearby farmers who needed labor.) Inevitably, this estate division sundered families, and none could have known that freedom — and the chance to regather their kin — was just a decade away. Who were the men and women that Kinchen Taylor enslaved? What became of them? Using names culled from the estate papers, I present them here, in alphabetical order, with notes recording what I know. Allen Sr. Valued at $1110. Allen Jr. Valued at $800. Amy and child Patience. Valued at $510. Amy and Patience included in lot of slaves distributed to Kinchen Taylor’s daughter Elizabeth Taylor. In the 1870 census of Liberty, Nash County: at #334, Simon Taylor, 60, and wife Amy. Anna included in lot of slaves distributed to Kinchen Taylor’s son Benjamin Taylor. In 1866 in Nash County, Arnold Taylor and Matilda Harrison registered a 20-year cohabitation, legalizing their marriage. In the 1870 census of Liberty, Nash County: at #351, Arnold Taylor, 45, wife Matilda, 40, and children Virgil, 17, Alice, 16, Ida, 14, Temperance, 12, Cora, 10, General, 8, Sherman, 6, William, 2, and John, 1 month. In the 1880 census of Whitaker, Nash County: at #550, Kinchen Taylor, 87, and wife Anicha, 65. At #551, Arnold Taylor, 54, wife Matilda, 47, and children Tempie, 18, Cora, 17, General, 18, Sherman, 15, William H., 12, Jefferson, 10, and Ann M., 3. At #552, Virgil Taylor, 25, wife Secie, 19, and “baby boy,” 4 months. Kinchen Taylor’s 1851 will bequeathed Sam, Cassa, Harriett, Rosetta, Berry and Daniel to daughter Winifred Taylor Rosser. Bob included in lot of slaves distributed to Kinchen Taylor’s son, John A. Taylor. Cain included in lot of slaves distributed to Kinchen Taylor’s son Henry A. Taylor. In the 1870 census of Liberty, Nash County: at #332, Cato Taylor, 30, and wife Sarah, 22. In the 1900 census of North Whitaker, Nash County: Cato Taylor, born March 1837; wife Sarah, born Jan 1849; and children Lee, 32, Cicero, 23, Blanche, 20, Mary, 15, Pink, 13, Indiana, 8, and grandsons Arthur, 8, and Clifton, 5. Sarah reported 8 of 11 children living. In the 1910 census of North Whitakers, Nash County: Kato Taylor, 70, wife Sarah, 60, children Blanche, 26, Mary, 21, and India 17, and grandchildren Lizzie, 13, Vinnie, 12, and Arthur, 19. Next door: Lee Taylor, 41, wife Mattie, 24, and children Roy, 5, Brisco, 2, and Dan, 3 months. Cato reported having been married twice; Sarah, once, and 10 of her 11 children were living. Mary Taylor Hilliard died 22 February 1914 in Nash County. Age 24. She was born in Nash County to Cato Taylor and Sarah Taylor. Informant, J.H. Cutchin. Lee Taylor died 11 March 1918 in North Whitakers, nash Ciunty. He was about 50 years old, born in Nash County to Cater Taylor and Sahrah [last name unknown]. Informant, Lumilia Hill. Buried Edgecombe County. 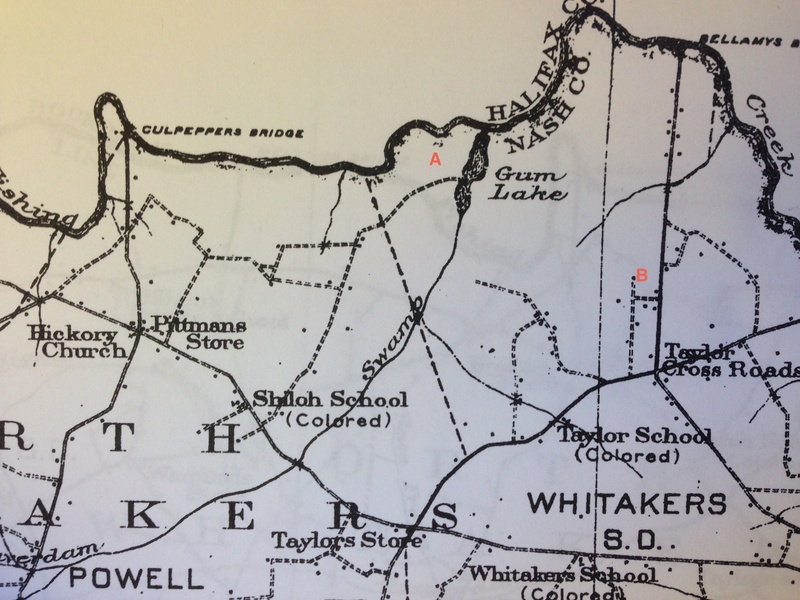 In the 1920 census of North Whitakers, Nash County: Nick Wright, 40, wife Endie, 23, and daughter Jennie, 4, with mother-in-law Sarah Taylor, 56, and father-in-law Cator Taylor, 58. Next door: Arch Wright, 39, wife Blanche 33, and children Bertha, 11, and Marion, 4. Kater Taylor died 11 February 1922 in North Whitakers township, Nash County. Married to Sarah Taylor. Born 1830 to unknown parents. Informant, Nick Wright. Sarah Taylor died 21 January 1924 in North Whitakers. Widow of Kater Taylor. Born 1834 to Nathan and Sindie Ricks. Informant, Nick Right. Essix Taylor died 10 November 1931 in Whitakers, Nash County. He was born 15 November 1854 in Nash County to Kater Taylor and an unknown mother. Informant, Lumilia Hill. Buried Edgecombe County. Kinchen Taylor’s 1851 will bequeathed Jane, Caesar, Harriett, Rosetta, Berry and Daniel to daughter Winifred Taylor Rosser. Caesar included in lot of slaves distributed to Kinchen Taylor’s son Benjamin Taylor. In the 1870 census of Liberty, Nash County: at #334, Simon Taylor, 60, and wife Amy; #335, Caesar Taylor, 34, wife Ann, 22, and daughter Amy, 3; #336, Edward Taylor, 32, wife Sylva, 23, and children Almira, 4, and James, 2. Chaney included in lot of slaves distributed to Kinchen Taylor’s son Henry A. Taylor. Chapman included in lot of slaves distributed to Kinchen Taylor’s son Henry A. Taylor. Kinchen Taylor’s 1851 will bequeathed Big Tom, Little Tom and Clary to wife Mary Blount Taylor. Clara included in lot of slaves distributed to Kinchen Taylor’s widow, Mary Blount Taylor. In the 1870 census of Liberty, Nash County: at #352, Clara Taylor, 72, in the household of Mariah Wheless. Dawson included in lot of slaves distributed to Kinchen Taylor’s daughter Caroline Taylor Knight, wife of William H. Knight. 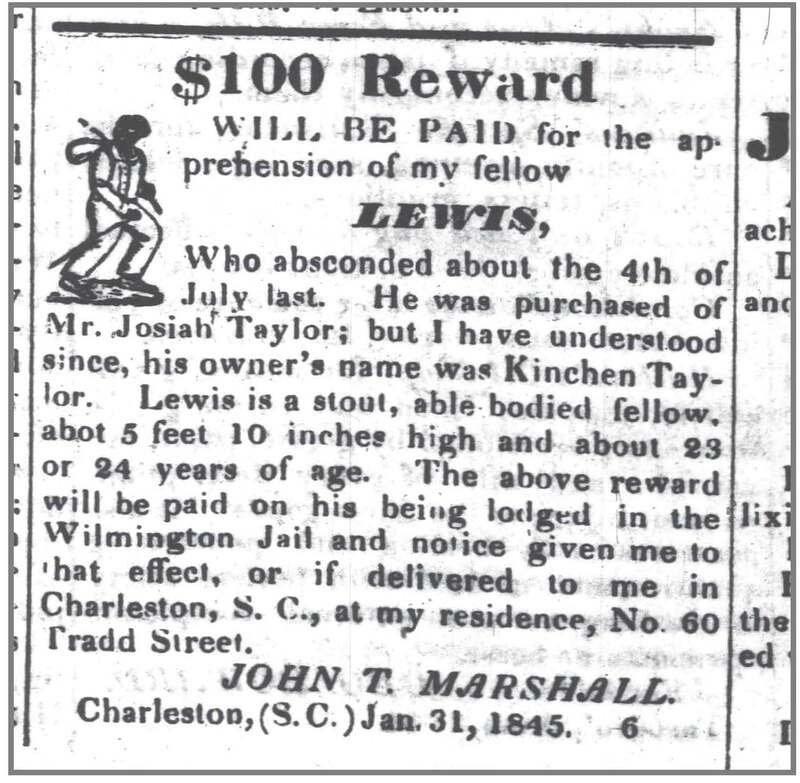 Doctor included in lot of slaves distributed to Kinchen Taylor’s son Henry A. Taylor. Dred included in lot of slaves distributed to Kinchen Taylor’s son John A. Taylor. Edmond included in lot of slaves distributed to Kinchen Taylor’s daughter Lucy H. Taylor Harvey, wife of John H. Harvey. Elizabeth included in lot of slaves distributed to Kinchen Taylor’s son Henry A. Taylor. Ella included in lot of slaves distributed to Kinchen Taylor’s daughter, Lucy H. Taylor Harvey, wife of John H. Harvey. Ellick included in lot of slaves distributed to Kinchen Taylor’s daughter Elizabeth Taylor. Elvira and children Joe, Faulcon and Ann. Valued at $1100. Eveline and children Willie/Wiley, Caroline and Isham. Valued at $1100. Eveline and children included in lot of slaves distributed to Kinchen Taylor’s daughter Elizabeth Taylor. Fanny and children Margarett, Lucy, Leah and Jolly. Valued at $1490. Fanny and children included in lot of slaves distributed to Kinchen Taylor’s son Henry A. Taylor. Feriby and children Dallas, Peter and Henrietta. Valued at $1230. In the 1870 census, Lower Town Creek, Edgecombe County: Green Taylor, 52, wife Phebe, and children Dallas, 19, Christiana, 14, McKenzie, 13, Mike, 9, and Sally, 1. In the 1880 census, Lower Town Creek, Edgecombe County, Green Taylor, 64; wife Phoebe; daughters Christiana, Kinsey, and Sarah; four granddaughters, Nannie, 5; Carrie, 1; Lizzie, 8; and Louisa, 5; and one grandson, Isaiah, 2. Mike Taylor died 8 Jan 1927 in Wilson NC. About 68 years old. Widower of Rachel Taylor. Born Wilson County NC to Green and Faraby Taylor. Buried 9 Jan 1927, Wilson NC. Informant, Roddrick Taylor. Frances and children Della, Carter and George. Valued at $1250. Frances and children included in lot of slaves distributed to Kinchen Taylor’s daughter Caroline Taylor Knight, wife of William H. Knight. In the 1870 census, Lower Town Creek, Edgecombe County, Green Taylor, 52, wife Phebe, and children Dallas, 19, Christiana, 14, McKenzie, 13, Mike, 9, and Sally, 1. Haley/Hilly and children Hasty, Amy and Glasgo. Valued at $1310. Kinchen Taylor’s 1851 will bequeathed Haley, Hasty, Amy, Glasgow, Alfred and Susan to daughter Caroline Taylor Knight. Handy included in lot of slaves distributed to Kinchen Taylor’s son John A. Taylor. Hanna included in lot of slaves distributed to Kinchen Taylor’s son John A. Taylor. Cooper Henry. Valued at $340. Cooper Henry included in lot of slaves distributed to Kinchen Taylor’s son John A. Taylor. Long Henry. Valued at $60. Long Henry included in lot of slaves distributed to Kinchen Taylor’s daughter Lucy H. Taylor Harvey, wife of John H. Harvey. Yellow Henry. Valued at $780. Yellow Henry included in lot of slaves distributed to Kinchen Taylor’s daughter Elizabeth Taylor. Ida included in lot of slaves distributed to Kinchen Taylor’s son John A. Taylor. Isaac included in lot of slaves distributed to Kinchen Taylor’s daughter Lucy H. Taylor Harvey, wife of John H. Harvey. Isabella and children Henrietta, Lucy and Joe. Valued at $930. Isabella included in lot of slaves distributed to Kinchen Taylor’s son John A. Taylor. Jack in lot of slaves distributed to Kinchen Taylor’s son Benjamin Taylor. Jane included in lot of slaves distributed to Kinchen Taylor’s widow, Mary Blount Taylor. In 1866 in Nash County, Jane Taylor and Jack Earl registered their 4-year cohabitation, legalizing their marriage. In the 1870 census of Liberty, Nash County: at #327, John Earl, 25, Jane, 22, and children John H., 5, and Conner, 1. Jim Sr. Valued at $333. In the 1870 census of Liberty, Nash County: at #329, James Taylor, 60, and wife Chaney, 65. Jim Jr. Valued at $580. Joe included in lot of slaves distributed to Kinchen Taylor’s son John A. Taylor or to son Benjamin Taylor. John Sr. Valued at $1025. John included in lot of slaves distributed to Kinchen Taylor’s daughter Lucy H. Taylor Harvey, wife of John H. Harvey. John Jr. Valued at $670. A second John included in lot of slaves distributed to Kinchen Taylor’s daughter Lucy H. Taylor Harvey, wife of John H. Harvey. Julia/July Ann. Valued at $200. Old Kinchen. Valued at $360. “Old Kinchen” included in lot of slaves distributed to Kinchen Taylor’s widow, Mary Blount Taylor. In the 1870 census of Liberty, Nash County: at #360, Kinchen Taylor, 70, and wife Bettie, 70, in the household of Kinchen Burtin, 32. Levinia and children Thadious and Frank. Valued at $1000. Levinia and children included in lot of slaves distributed to Kinchen Taylor’s daughter Elizabeth Taylor. Big Lewis. Valued at $40. Lucinda and children Ella, Olive and Angeline. Valued at $1240. Kinchen Taylor’s 1851 will bequeathed Lucinda, Jane, Washington and Ellin to wife Mary Blount Taylor. Lucinda and children included in lot of slaves distributed to Kinchen Taylor’s widow, Mary Blount Taylor. In 1866 in Nash County, Thomas Taylor and Lucinda Taylor registered their 35-year cohabitation, legalizing their marriage. Lucy Sr. and child Turner. Valued at $640. Lucy and Turner included in lot of slaves distributed to Kinchen Taylor’s son Henry A. Taylor. Perhaps, in the 1870 census, Liberty, Nash County: at #359, William Taylor, 24, and Lucy Taylor, 52. Lucy included in lot of slaves distributed to Kinchen Taylor’s son John A. Taylor. Margaret included in lot of slaves distributed to Kinchen Taylor’s daughter Elizabeth Taylor. Mariah included in lot of slaves distributed to Kinchen Taylor’s daughter Caroline Taylor Knight, wife of William H. Knight. Matilda and child Calvin. Valued at $405. Matilda and children Calvin, Lucy and Violet included in lot of slaves distributed to Kinchen Taylor’s son Benjamin Taylor. Moll and child Martha. Valued at $640. Molly and Martha included in lot of slaves distributed to Kinchen Taylor’s daughter, Lucy H. Taylor Harvey, wife of John H. Harvey. Mourning included in lot of slaves distributed to Kinchen Taylor’s widow, Mary Blount Taylor. In 1866 in Nash County, Mourning Taylor and Jacob Ing registered their 20-year cohabitation, legalizing their marriage. In the 1870 census of Formosa, Halifax County NC: Jacob Ing, 70, and wife Mourning, 65. Miry Gunter died 16 April 1919 in Whitakers, Nash County. Widow. Born about 1865 in Edgecombe County to Ned Taylor of Nash County and Sylvia Bridges of Edgecombe County. Informant, Ed Taylor. Buried Whitakers. Frank Taylor died 31 March 1923 in North Whitakers, Nash County. Married to Pearlie Taylor. Born 16 August 1881 in Nash County to Ned Taylor of Nash County and Sylvia Bridget of Edgecombe County. Informant C.W. Williams. Buried Edgecombe County. Annie Parker died 23 April 1951 in Rocky Mount, Edgecombe County. Born 8 December 1871 in Nash County to Ned Taylor and Sylvester Williams. Informant, W.E. Parker. Mary Ella Hunter died 12 October 1959 in Whitakers, Nash County. Born 1 May 1889 in Nash County to Ned Taylor and Sylvia Taylor. Nick included in lot of slaves distributed to Kinchen Taylor’s son Henry A. Taylor. Penny and children Carter Jr., Mary and George. Valued at $1300. Penny and children included in lot of slaves distributed to Kinchen Taylor’s daughter, Lucy H. Taylor Harvey, wife of John H. Harvey. Pink included in lot of slaves distributed to Kinchen Taylor’s widow, Mary Blount Taylor. In 1866 in Nash County, Pink Taylor and Abel Earl registered their 4-year cohabitation, legalizing their marriage. Sam included in lot of slaves distributed to Kinchen Taylor’s daughter Elizabeth Taylor. Kinchen Taylor’s 1851 will bequeathed Isham, “Tany’s child Sandy,” and Simon “now in his possession” to son Kinchen C. Taylor. Simon included in lot of slaves distributed to Kinchen Taylor’s daughter Elizabeth Taylor. “Big Tom” included in lot of slaves distributed to Kinchen Taylor’s widow, Mary Blount Taylor. Tom Jr. Valued at $820. “Little Tom” included in lot of slaves distributed to Kinchen Taylor’s widow, Mary Blount Taylor. In the 1870 census of Liberty, Nash County: at #323, Thomas Taylor Jr., 35, wife Caroline, 25, and children George, 2, and John, 6 months. In the 1880 census of Whitaker, Nash County: Thomas Taylor, 36, wife Caroline, 30, and children George, 13, Mack, 11, Rosella, 6, Eddie, 5, Cindy, 3, and Fannie, 4 months. Lucinda Arrington died 26 February 1933 in Rocky Mount, Nash County. Married to W.E. Arrington. Age 40. Born in Nash County to Thomas Taylor and Carolin Taylor. Informant, W.E. Arrington. Lena Taylor died 19 July 1946 in South Whitakers, Nash County. Married to John Taylor. Born 31 December 1883 to Thomas Taylor and Carolina [last name unknown.] Buried Jerusalem cemetery. Rose Ella Williams died 26 November 1960 in Nashville, Nash County. Resided Whitakers. Married to Robert Williams. Born in Nash County to Tom Taylor and Carolyn [last name unknown.] Informant, Thomas W. Williams. Buried “Jewrusalem,” Edgecombe County. Virgil in lot of slaves distributed to Kinchen Taylor’s son Benjamin Taylor. Washington included in lot of slaves distributed to Kinchen Taylor’s widow, Mary Blount Taylor. William Henry. Valued at $750. William Henry included in lot of slaves distributed to Kinchen Taylor’s son John A. Taylor. Perhaps, in the 1870 census of Liberty, Nash County: at #339, William Taylor, 21, wife Hannah, 23, and son Cato, 5; or, at #359, William Taylor, 24, and Lucy Taylor, 52. Some preliminary thoughts: there were several unrelated white Taylor extended families in antebellum Nash County, North Carolina (not to mention bordering counties) and, while Kinchen may have been the largest among them, many owned slaves. Some of men and women listed died before freedom came or were sold away. Even taking these fates into account, surprisingly few African-Americans Taylors registered cohabitations in 1866 or were enumerated in the county in 1870. No doubt, many freedmen elected some other surname or moved a few miles away into adjoining counties. Women and small children may have adopted the surname of a husband (alive, dead or otherwise absent) or father (ditto). Moreover, as older children were not grouped with their mothers in the inventories, the relationships among members of the community are obscured. Naming patterns and living arrangements disclosed in censuses hint at such connections. Tracing Kinchen Taylor’s slaves has been frustratingly difficult, but I don’t quit. Sources: the file of Kinchen Taylor (1853), Nash County, North Carolina Estate Files 1663-1979, https://familysearch.org, original, North Carolina State Archives; Nash County Cohabitation Records, North Carolina State Archives; federal censuses. DNAnigma, no. 7: Locus, Eatmon, et al. R.B.W. is my father’s estimated 2nd-4th cousin. They match on chromosomes 5, 18, 20, 21 and 22, and she lists Blackwell, Eatman, Hawkins and Lucas among her surnames. M.F. is my father’s estimated 3rd to 5th cousin. She lists Locus/Lucas, Eatman, Brantley and Howard among her surnames. E.F. is author of Free in a Slave Society:The Locus/Lucas Family of Virginia and North Carolina, Tri-Racial, Black-Identified, over 250 Years of History, a compendium of research notes, charts and photographs chronicling one of the largest free colored families in the antebellum United States. He notes that the Locus/Lucases intermarried with several free colored families, including Deans, Wiggins, Pulley, Taylor, Wells, Blackwell, Colston, Richardson, Brantley, Howard, High, Williams, Hagans, Evans, Tayborne, Eatman, Vaughn, Strickland, Jones, Pridgen and Allen. E.F. matches my father on a tiny stretch of chromosome 19 (which I did not inherit); 23andme estimates that they are 3rd to distant cousins. T.W.is my estimated 4th-6th cousin per Ancestry DNA. Her father was born in Wilson County and is descended from Locus/Lucases and Evanses (another free family of color). T.J. is an adoptee whose birth mother is believed to be a Jones and Locus. She is an estimated 3rd to distant cousin to my father. Leasy Hagans. Leasy Hagans appears in a Nash County census and may have originally lived north and west of where she settled in Wayne. It is not clear whether Hagans is her maiden or married name. Nor is the father of her children known. Was she, or he, a Locus? An Eatman? A Brantley? Tony Eatman. Willis Barnes‘ death certificate lists his parents as Tony Eatman and Annie Eatmon. Tony was born free about 1795 and is listed as a farmer in the household of white Theophilus Eatman in the 1850 census of Nash County. (He also is listed as the groom’s father on the marriage license of Jack Williamson and Hester Williamson in 1868.) One potential problem with Tony as my Locus link, though, was explained here. If Willis Barnes were Rachel Taylor’s stepfather, I am not descended from Tony Eatman at all. Green or Fereby Taylor. Delphia Taylor Locus was the daughter of Eliza Pace and Dempsey Taylor, a free man of color born circa 1820 in northern Nash County. His relationship to another Dempsey Taylor in the area is assumed, but has not been proven. One white Dempsey (there were several) was the son of Reuben Taylor and the brother of Kinchen Taylor, Green and Fereby’s owner. There is no tradition of white ancestry among the Taylors, but their Y-DNA haplogroup appears to be J2b1, which is European. Was Green — or Fereby, for that matter — descended from Kinchen Taylor or one of his relatives? Photo courtesy of Europe Ahmad Farmer.